I don’t know why I keep doing this to myself but it’s becoming somewhat of a habit of mine. Most runners, triathletes, or other sporting participants look to enter at least a couple of events every year; it helps to focus your training, it’s a good test of fitness, you get the “runner’s high”, and of course there are the elusive PBs to chase!The other thing most runners do is choose an event that’s representative of how they train, or what they want to achieve. For example a marathon runner will likely enter a 10k to test their speed, a half marathon to practice pacing, and a 20 miler to get experience of endurance racing. I, on the other hand, seem to choose events that are likely to end up with me covered in mud, soaked through to the skin, showered with bruises, or reading disclaimer forms that instill fear in even the most gnarly of participants.There I am, looking through a list of races and all of a sudden I come across the words “unforgiving course”, “gruelling and engaging obstacles”, “test of stamina, grit, speed and guts” and that’s it – I’m sold! 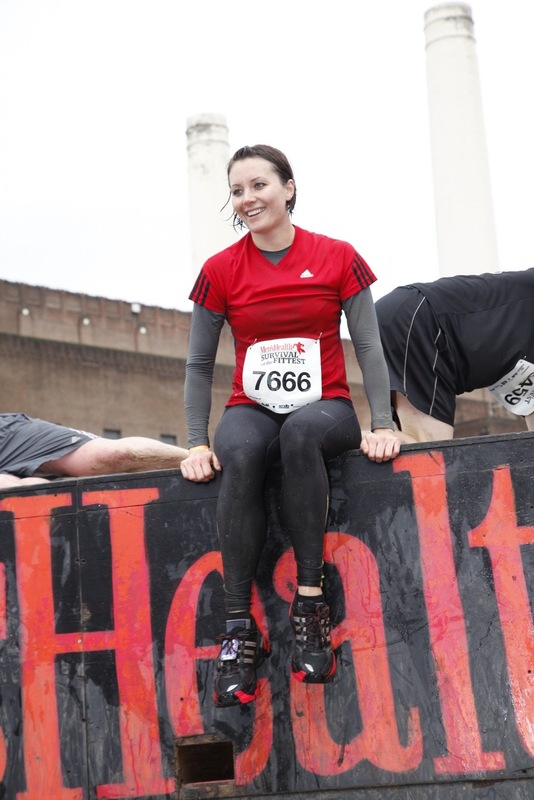 Men’s Health Survival of the Fittest is an urban assault course, taking the fabrics of the city and using them against you in ways you never thought possible. For 2012 the organisers (Rat Race Adventure Sports) put on not one, not two, but five separate event locations, with a day and night option for the London location as well. The classic tri-nations event consists of the inaugural Nottingham, plus Cardiff and Edinburgh to boot. London was added as an extra location for 2011 (which was my foray into “Survival”) and in 2012, Manchester joined the madness. 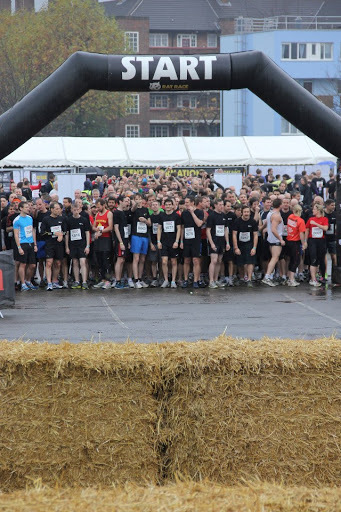 Having taken part in the London event in 2011 I’d let the post-race euphoria take over and had entered for the 2012 race to be held on Saturday 17th November as soon as registration opened. 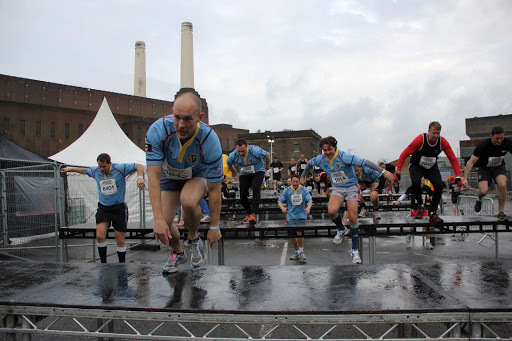 Once again the race was to be based at the amazing Battersea Power station. 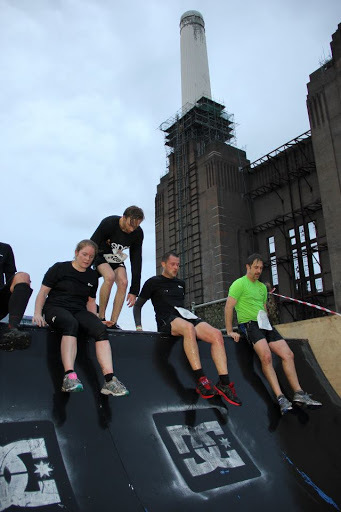 I cannot think of a better backdrop for an urban race than the decommissioned coal-fired power station and the largest brick building in Europe. Waking up early on Saturday morning, I’d already packed my bag with my list of “forgotten items” from the previous year. For this race a change of clothes and towel is essential! I had some breakfast (a couple of slices of toast and peanut butter) and a cup of tea, and out the door I went. On the train on the way into London the nerves started to set in. 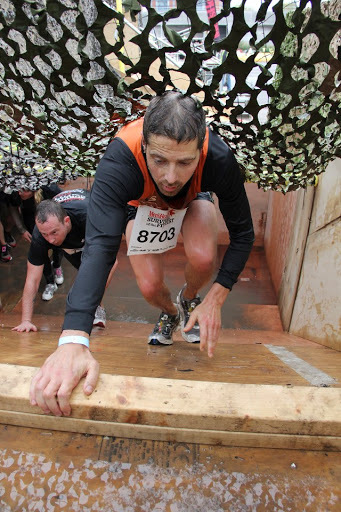 I always get nervous before a race, but for obstacle races even more so as I never quite feel fully prepared. I’d already seen reports that it was due to rain, but was still hoping it might hold off. Unfortunately almost as soon as I’d registered the showers came down and it was hoods up waiting for the start. Soon enough my time came to make my way to the start line. I stayed fairly close to the back for fear of being trampled by the melee and the countdown started. As soon as the klaxon sounded we were off and within 20 strides or so was our first obstacle, the hay bales. It soon became clear that tactics had failed me and whilst at a lower risk of being clobbered by flailing limbs, I was also having to wait for the 300 or so people in front of me to make their way over before I could. This was not going to be a fast race! The support at the start is great with spectators allowed to stand alongside the starting straight but once over the hay bales and round the corner it’s just you, your fellow runners and your sense of impending doom. Next up was the parkour section, which I have to say I tackled in a much less graceful manner than the likes of Sebastien Foucan, but at least I didn’t let too much of my clumsy nature take over. Soon enough I was faced with a scaffold-framed MDF-clad wall to surmount. I threw myself at it and realised after a couple of pathetic kicks that I was not going to make it over solo. I turned to my right and a moustache-adorned man offered me a foot up. The organisers are definitely right when they talk about camaraderie within the race. Not long after was the army assault course with some tyres to hop over and a cargo net draped over an a-frame where a bit of a queue had already formed. A few of us stood and chatted while we waited for an opportunity to climb. And then came the first water obstacles – a rope swing closely followed by a big inflatable pool to wade through. After another one or two obstacles I was out of the event village and on my way out to Battersea Park. 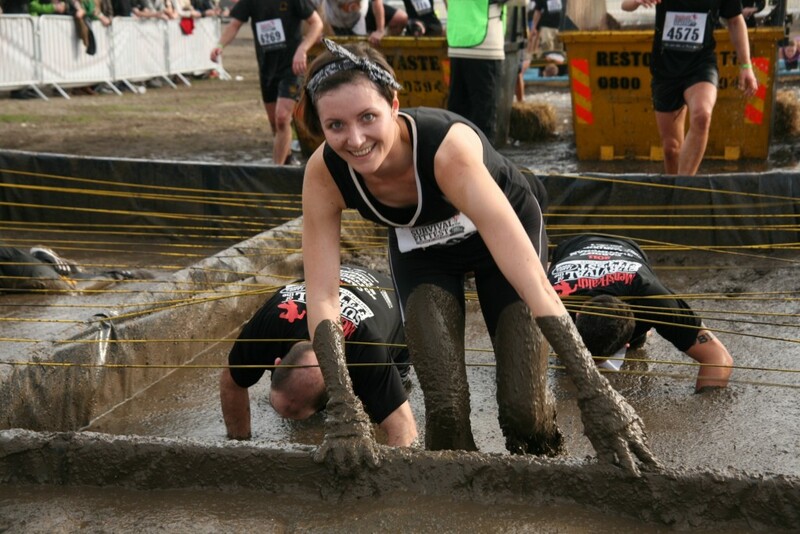 With about 1.5km of clear running before the next obstacle I managed to gather myself and shake off my muscles. After running along the river path and back round past the Peace Pagoda the race turned into an athletics track used for steeplechase. 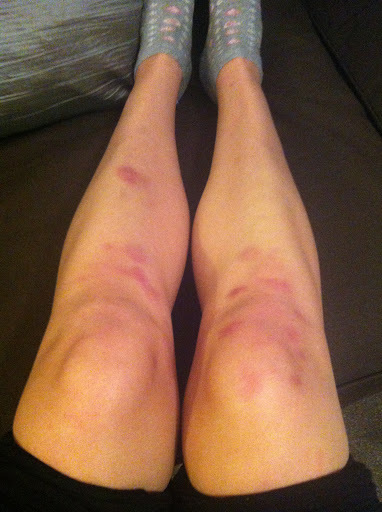 I jumped over the hurdles, the last of which went straight into a water pit, and ran back out of the track. A little bit more of clear running led us across a manned traffic crossing where I had to wait for the lights to change (yet more time lost!) and alongside the tracks that run past the power station, then under them where there was a strategically placed mountain of tyres to clamber over. Soon enough I doubled back to the power station and was handed a hard hat before I could make my way inside the disused building where I was faced with a tractor tyre to climb through. At the bottom of a short hill was an a-frame to climb, then a rope tangled frame which reminded me of those films with the laser beams in bank heists! Next was a 3ft cone to carry round a section of the course, then a short sharp hill to run up to exit the first indoor section. The next indoor area housed sandbags, one of which I hauled onto my shoulders. Stepping over hurdles becomes a bit more difficult with a heavy sandbag on the back of your neck, but I managed it and was soon on my way out of the second indoor section. Then yet more tractor tyres and scaffolding structures to climb through, and onto the beer tent where we each had to grab an empty (luckily!) keg to run through with. 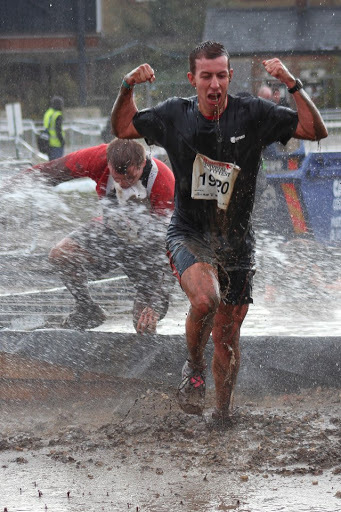 The next part has to be one of my favourite obstacles from the previous year… a big old tray full of ice cubes, followed by a mud and leaf infested water filled skip, another tray this time full with mud, which upon your exit is immediately followed by a spray down with a fire hose! As I smiled to one of the marshalls she kindly informed me I had something in my teeth…. ewwww! Next up was a neck-high pool of ice-cold water and then I was on past the spectators, through another lorry trailer and into the back entrance of the power station. 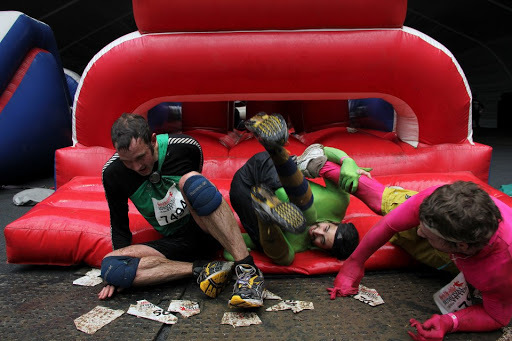 Now this is going to be hard to believe, but one of the the hardest parts of the race was this next obstacle which was, essentially, a bouncy castle. No lie! This thing had a life of it’s own and was like a beast fighting it’s final moments. It seemed to be slowly deflating and with every tumble I was practically on the floor. As burly men came rushing through the whole thing would subside and I’d end up in a heap. Eventually I managed to pull myself out of the rubbery mess and make my way bouncily out of the building. Plenty of lost race numbers from this treacherous section! The end was now in sight, with just over a kilometre left to travel, and “only” five more obstacles to navigate I was nearly done. And then… oh great, another queue! This one was the longest of all, with only three people able to go at once but I soon got chatting with other runners again who were all buzzing with the excitement of it all. One took off his pair of gloves and a fistful of debris fell to the floor, another proudly showed off his battle-wound of a small cut on his shin. We all joked about our rough and tumbles along the way. Eventually we reached the front of the queue and the guy behind me asked me nicely not to kick him in the face on my way through! There were two big structures with skate ramps to run up and over, and then slide back down the other end, now back in view of the spectators wildly cheering. I turned the corner, climbed over and through another scaffold structure, and was faced with my nemesis from last year’s race – the wall of fame! Having offered one guy a foot-up at the previous obstacle he kindly returned the favour and then there I was sitting on the top of the world (well, just a wall) looking down and wondering how much it would hurt if I landed badly. Eventually I plucked up the courage and leapt from the 8ft high wall and did my very best victory jog to the finish line. Finished! Taking a moment to pluck up the courage to leap from the Wall of Fame! I have to admit to being really pleasantly surprised at the organisation of the finish as no sooner had I taken my timing chip off than I was through the other end with a medal round my neck and a goody bag filled with actual goodies! A lot of races these days offer a “goody bag” but when you get to the end of the race all you receive is a bag with a scattering of leaflets, maybe a shampoo sample or two, a chocolate bar if you’re lucky, and a bottle of water. But this one was different – protein shake sample, flaxseed, snack size Soreen, snack size Eat Natural bar, copy of Men’s Health magazine, snap on high vis arm band, bottle of water and, of course, some leaflets. That and the decent medal, and pretty nice technical t-shirt, makes this the most materially rewarding race I’ve done, which is enough to make anyone feel slightly better about being bashed around, covered in mud and then sprayed with a fire hose! There was no way I was expecting to come out of this race without feeling a little battered and bruised, and sure enough later on Saturday evening I inspected my legs to find a collection of small bruises. Sunday morning, getting out of bed feeling like I’ve been hit by a bus, would have cause much amusement to anyone if they’d been watching me hobble! It just goes to show what a demand this race places on your body, making you use every single muscle in ways you’re not used to using. The start of the race was well organised and the waves are small enough for you to be able to get a fairly decent start without feeling too crowded. The event village was lively and had something for spectators, with plenty of food vans and music playing throughout the day. The obstacles are challenging, but as safe as they can be, and the race is clearly well thought out to get the most out of everyone taking part. All the marshalls were friendly and encouraging, and there was a really fun atmosphere with photographers snapping the messiest moments. The finish was well organised, and the goody bag, t-shirt and medal are great perks. Unfortunately, the portaloos at the start of the race were a bit of a disaster, having already run out of toilet paper by 9:30. 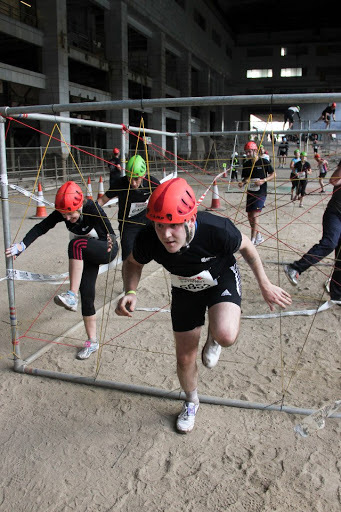 The queues for some of the obstacles were a bit frustrating – some of the bottlenecks could have been widened with just a little more ability for multiple runners to complete at once or some more careful planning with the order of obstacles and space between. The road crossing also meant a time delay which is both frustrating and can also result in muscles cooling down too much while you wait. Overall though, I would give this race a massive thumbs up – having crossed the line and saying I would probably leave my Men’s Health Survival of the Fittest race count at two, I am already planning a comeback with a team of like-minded nutters. This race is addictive! There is something amazing about the feeling you get from completing an event like this, and I would thoroughly recommend it. Thank you 🙂 Would love to hear how you get on! interesting read! I am thinking of doing the London edition this year but as I don’t have like minded nutter friends I am considering doing it solo. From experience is it a good idea, are people helping each other? Thanks Pauline! I would definitely recommend doing it – it’s a great race 🙂 I’ve done it twice now, both times solo, so you’ll be sure to get round on your own! You probably won’t need much help, as almost all the obstacles can be tackled one-on-one, with the main exception being the wall at the end, but everyone helps each other! Please do let me know how you get on if you do do it! Oh brilliant! Look forward to hearing all about it!